The first step in crocheting my baby summer dress. 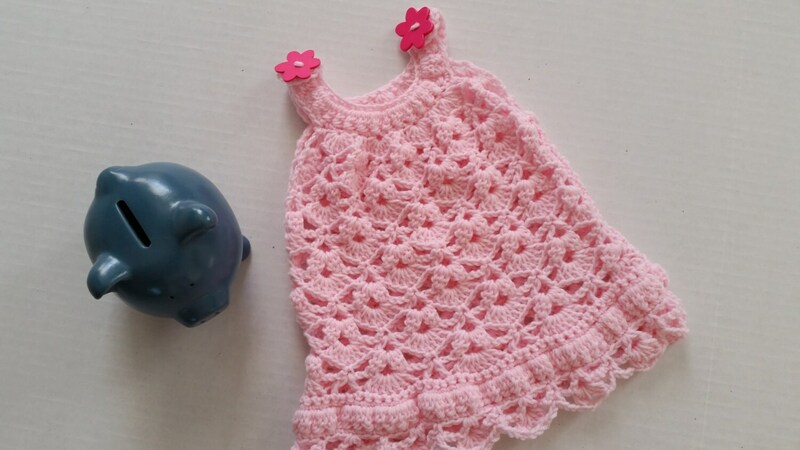 Keep your newborn baby girl in style this summer in this pretty pink crocheted dress. I used Plymouth baby yarn which is ultrasoft in a pastel shade of pink. The dress is crocheted in an open stitch with a pretty scalloped edging. To brighten the dress up even more, there are bright pink flower buttons on the shoulder straps which open to make it easy dressing up your gorgeous little princess. This dress is "OOAK" and ready to ship! This dress would make a great baby shower gift or a gift just to say "Congratulations". The yarn is a blend of acrylic and nylon and can be machine washed on gentle and tumbled dry on low.